The news almost reads like an Onion headline: Sweden, the country, has got its very own telephone number. And you can call it anytime you like to chat with a random Swede about, well, anything really. 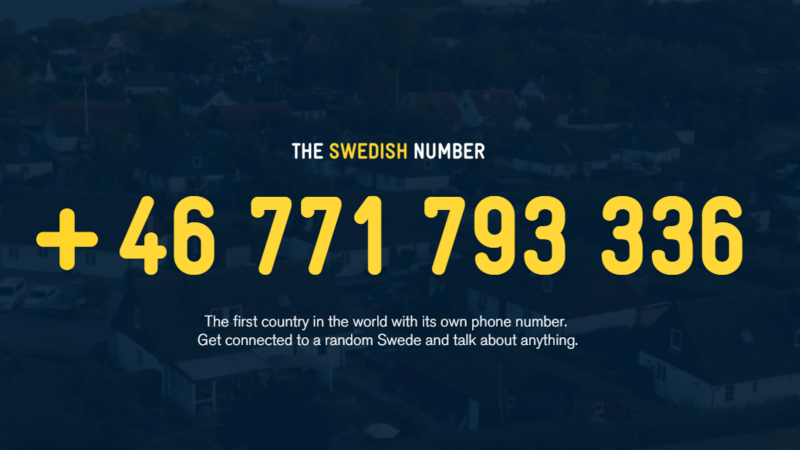 The quirky announcement is the work of the Swedish Tourist Association, which has created the number as a 250th anniversary tribute to the country’s abolishment of censorship. It’s an initiative designed to highlight the country’s commitment to freedom of expression in a time when, according to the tourism board’s CEO Magnus Ling, “many countries try to limit communication between people.” But before you open the dialer on your cellphone, be aware that the call is not toll-free and you will be charged local and international rates. In the spirit of ‘why not?’ (and because I have some Google Voice credits to burn), I called the number hoping to engage a Swede in some discussion about Weezer’s new album. The results were disappointing. On my first attempt, I was connected to a Swedish man who rambled a bunch of very polite sounding Swedish noises into my ear. I asked if he spoke English, but then the line soon went dead. So I tried calling again. The second time, I had to wait a bit as a recorded message informed me that “a lot of people are calling Sweden right now.” Obviously. When I did manage to get through to another Swede, the call quality crapped out, prompting a handful of broken “hellos” back and forth and not much else. I never did find out what Sweden thinks of Weezer’s White album… if they think it’s as good as Pinkerton. But maybe one of you intrepid folks can spare the change and bridge that social divide.